Jonathan Rea returned home from round two of the FIM Superbike World Championship in Thailand this week to receive further recognition of his recent racing achievements. 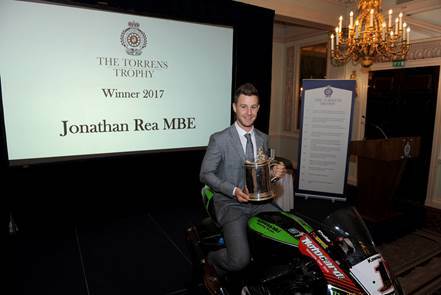 The current triple world champion was awarded the Royal Automobile Club’s coveted Torrens Trophy on Thursday 29th March 2018 at the Pall Mall clubhouse for being the first rider to win three consecutive Superbike World Championships. For Rea, it is the latest in a string of high-profile accolades, from finishing runner-up in the Sports Personality of the Year contest, just 2,957 votes behind winner Sir Mo Farah, to being awarded an MBE in the Queen’s Birthday Honours. The Royal Automobile Club has always had a close association with the motorcycling world. The Club formed the Auto Cycle Club in 1903, which went on to become the Auto Cycle Union in 1947. The first Tourist Trophy race was held on the Isle of Man in 1905 for cars - two years before the first TT for motorcycles. The Torrens Trophy was first awarded in 1978 in memory of Arthur Bourne, a motorcycling journalist who wrote a column under the pseudonym Torrens, which is Latin for ‘stream’. Arthur Bourne was also a Vice-Chairman of the Royal Automobile Club. 2016 MotoGP racer Cal Crutchlow for being first British rider to win a premier class World Championship Motorcycle Grand Prix in 35 years. 2015 Eleven-time TT winner Ian Hutchinson for his outstanding determination, courage and overcoming adversity to win multiple TTs. 2014 Shane ‘Shakey’ Byrne for becoming the first man in history to be crowned MCE Insurance British Superbike Championship on four occasions (2003, 2008, 2012 and 2014). 2013 Tom Sykes for being crowned the 15th World Superbike Champion, the fourth from Great Britain and only the second rider to win for Kawasaki in the series for 20 years. 2008 World Superbike Champion James Toseland was awarded the Trophy for his immense contribution to raising the profile of motor cycle racing in this country. 1998 Ian Kerr of the Metropolitan Police for 20-years of tireless work in promoting safe and responsible motorcycling. 1989 BMW in recognition for their contribution to motor cycle safety through their development of their anti-lock braking system. 1981 Dave Taylor MBE for his vast contribution to motorcycle road safety. 1980 Transport and Road Laboratory. 1979 Lieutenant-Colonel Fredrick Lovegrove OBE.